Gov. Rosselló, at podium, offers details of Puerto Rico's role in the Caribbean recovery efforts in the wake of Hurricane Irma. Gov. Rosselló, at podium, offers details of Puerto Rico’s role in the Caribbean recovery efforts in the wake of Hurricane Irma. Despite experiencing some $600 million in damages in the wake of Hurricane Irma’s passage through the Caribbean last week, Puerto Rico was less affected than the rest of the region and has assumed the role of “safe haven” for those who experienced the storm’s harshest forces in the Lesser Antilles. Saying because the island’s infrastructure and public services remain operational, the local government has been collaborating with federal administration officials in the repatriation of U.S. citizens stranded in the Caribbean islands. During a news conference in Washington, DC on Thursday, he said the U.S. Department of State calculates that when Hurricane Irma hit the Caribbean, more than 6,000 U.S. citizens were in the affected region. Federal and Puerto Rican authorities have evacuated more than 2,000 of them so far; another 2,000 are expected to arrive in coming days. In partnership with the U.S. Department of Health and Human Services, Puerto Rico is also facilitating travel and access to Puerto Rican hospitals to those in need of medical assistance, he said. “I am grateful to President Trump’s administration for trusting Puerto Rico with this historic endeavor. As the closest United States territory to the islands affected by Hurricane Irma, it is our duty to offer refuge to those in need. This is what America is all about,” Rosselló said. World-renowned business magnate Richard Branson is currently collaborating with the Government in relief efforts for the British Virgin Islands. In an exclusive interview with this media outlet, he said the governor’s assistance has been “fantastic” and that he is “very appreciative” of his support. “Puerto Rico suffered the impact of Hurricane Irma, yet even so our island’s spirit of solidarity has opened our doors to aid and shelter our brothers and sisters of the Lesser Antilles who endured the worst of the hurricane’s havoc,” said Puerto Rico’s Resident Commissioner in Washington, Jenniffer González. “That is one of the traits that distinguishes us as a people and leads us to receive our neighbors from the U.S. and British Virgin Islands and Saint Martin/Sint Maarten in our island in their time of need,” said González, who has remained in communication with the federal agencies and joined efforts with her fellow Members of Congress from affected states and territories to appropriate the emergency funding. 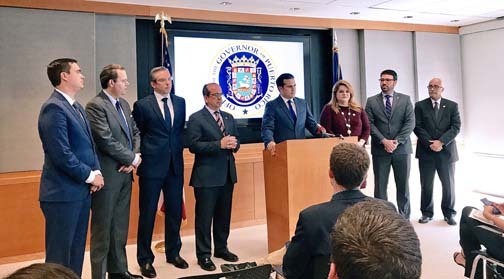 The Resident Commissioner has been in direct contact with the secretaries of the Federal Emergency Management Agency, the U.S. Small Business Administration, the Department of Health and Human Services, the Office of Management and Budget, the American Red Cross, the U.S. Corps of Engineers, and the White House for the approval of emergency funding. The reconstruction of Saint-Martin/Sint Maarten, Saint-Barthelemy, the U.S. and British Virgin Islands, Anguilla, Barbuda, and other Caribbean territories and nations will likely take years. Rosselló and González will continue to monitor the situation, and provide assistance as needed, they said. Hey Buddy!, I found this information for you: "Rosselló: PR is regional hub for emergency management". Here is the website link: https://newsismybusiness.com/rossello-emergency-management/. Thank you.